The Highlights: A walk through the peaceful forest and landscapes that inspired poet Walt Whitman; Long Island’s highest point; the home of Walt Whitman; excellent dining options; a film and arts center. Other Places Nearby: The attractive village of Cold Spring Harbor and its whaling museum; President Theodore Roosevelt's mansion; the Vanderbilt Mansion and planetarium. Meetings & Event Options: The Hilton Long Island/Huntington in nearby Melville has the most space, including a huge ballroom. OHEKA Castle hotel has vast outdoor lawns and gardens and five indoor meeting spaces. Many places on Long Island inspired the writing of America’s great poet Walt Whitman, but none was more meaningful than West Hills. Whitman was born there on May 31, 1819, and later fell in love with its natural beauty. He admired the tall trees, apple orchards, cornfields and pastureland that stretched for miles. Your walk begins (see Getting Here and A Recommended Walk) at the old wooden farmhouse where he lived until just before his fourth birthday. “O to go back to the place where I was born,/To hear the birds sing once more,/To ramble about the house and barn and over the fields once more,/And through the orchard and along the old lanes once more.” The author of those passionate lines in the poem “A Song of Joys” would be shocked today to find a shopping mall in his name on a commercial strip adjacent to his home. Thankfully, the wooden farmhouse is removed from the bustle, and this walking tour leads you into a peaceful county-run forest that has withstood decades of surrounding development. Today, leaves of tall trees that have grown next to the hill block much of the view in summer, and you’ll need a crystal-clear day — and a rabbit’s foot — to spot the distant ocean. But it’s still a fascinating historical spot and a nice introduction to the wonders of the soft, sand-bottomed forest you are about to explore. You weave your way around oak, maple, beech, ash, and long-needled pine trees and can stop at a riding stable for a horseback ride through the forest. Whitman’s family left this land for Brooklyn, where Walt attended public schools until the age of 11 and started work as a printer’s apprentice the following year. He returned to Long Island in 1836 to teach in rural schools in Woodbury and Huntington, living with families in the school districts. Two years later, he started editing The Long-Islander newspaper and began working in the presidential campaign of Martin Van Buren. Between 1842 and 1848, he bounced from newspaper to newspaper in New York City. He served as an editor for such papers as The New York Mirror, The Tattler, The New York Democrat, the New York Sun, and the Brooklyn Daily Eagle, where he was fired for his anti-slavery views. He departed for a three-month stint down south at the New Orleans Crescent before returning to New York to dabble in several jobs: building contractor, real estate speculator, manager of a stationery and printing store, and freelance writer. Finally, in 1855, he published the first edition of Leaves of Grass, his first poetry book. The 83-page book contained a dozen poems and a picture of Whitman but included no author’s name. An even greater oddity — one that turned off many literary critics of the era — was that none of the poems rhymed. The unconventional book spoke mostly about the lives and occupations of the everyday man, as well as the direction of equality of the sexes and equality of the rich and the poor. But many critics were even more incensed by his glorification of the naked body. His former paper The Long-Islander called Leaves of Grass a “dirty book,” citing the sexual content in some of the lines. Most bookstores refused to carry it, but Whitman was not deterred. He sent a copy to the most renowned U.S. poet of the time, Ralph Waldo Emerson, though the two had never met. Emerson fell in love with Whitman’s poetry. In a private letter to Whitman, Emerson praised Leaves of Grass as “the most extraordinary piece of wit and wisdom that America has yet contributed.” Whitman, ever the self promoter, hustled to put out a second edition. Without receiving permission, he published Emerson’s letter to stimulate sales and convince the critics of the importance of his works. Emerson was furious, but Whitman continued to promote. He eventually would produce nine editions of Leaves of Grass, each with different poems included inside. During his lifetime, his poetry became known throughout America and England, but it never made Whitman wealthy. He constantly had to fight a backlash from critics who deemed several of his poems obscene. While working as a clerk in the Department of the Interior’s Indian Affairs Bureau in 1865, he was fired by Interior Secretary James Harlan for being the writer of an “indecent” book. But Whitman’s works withstood the test of time, and he became known after his death as, arguably, America’s greatest poet, as well as the poet of democracy. 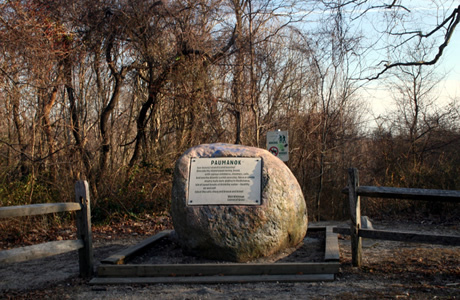 Millions have been moved by the sheer beauty of his writing and by his fervent love for the geography of Long Island, including the land you are passing through during your walking tour.